David L. Levy, UMass Boston. It’s approaching three years since hurricane Sandy killed over 230 people in 8 countries, and wreaked havoc on the New York-New Jersey region – and put climate adaptation firmly on the national agenda. Sandy, which disrupted at least 450,000 businesses in New York and New Jersey, illustrated how cascading impacts not only damage property but also disrupt businesses for extended periods of time, due to the interaction of power and communication outages, infrastructure damage, and supply chain disruptions. These complex interactions were not adequately understood or anticipated. 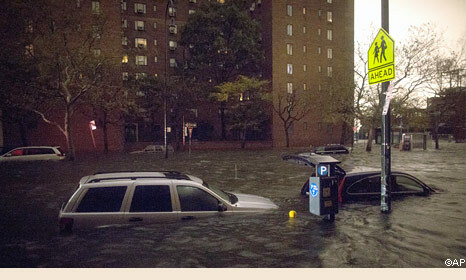 The reinsurance company Munich Re has estimated insured losses at $25 billion and total losses of at least $50 billion in the US from Sandy. Looking to the future, the 2011 Mass Climate Adaptation report notes that: “Sea level rise of 0.65 meters (26 inches) in Boston by 2050 could damage assets worth an estimated $463 billion”. Cities and states have begun to devote significant resources to planning for sea level rise, more frequent and intense storms, and more intense heat and drought. In one design-for-climate-change scenario, Boston would be transformed into an American Venice. The fossil fuel industry’s camp aign to deny climate change and oppose the regulation of greenhouse gases is a well-researched and publicized story. Much less is known, however, about the role of corporate scientists in shaping the internal perspectives on climate change in these companies, and the impact on corporate response strategies. Recent revelations by InsideClimate News show that from the late 1970s to the mid-1980s, Exxon funded its own scientists to engage in a serious research program, which pointed to conclusions that broadly matched those of the broader climate science community. Indeed, during the 1980s, Exxon put plans on hold to develop the massive Natuna gas field off the coast of Indonesia, because of concerns that nearly two-thirds of the gas was carbon dioxide, and there was no economically viable way to capture and dispose of it. The Volkswagen diesel scandal has been dominating recent news headlines. The U.S. Environmental Protection Agency (EPA) is accusing the German automaker of using a ‘defeat device’ that manipulates results of health-threatening nitrogen oxides emissions tests by switching the engine to a low-emissions mode when detecting a test. Following the accusations two weeks ago, VW’s stock price has dropped by 40%; Martin Winterkorn has lost his job as CEO; VW will be removed from the Dow Jones Sustainability Index; and the German multinational is facing a lasting damage to its long-built reputation. On top of that, the automaker will need to refit up to 11 Million diesel cars and vans running with the ‘defeat device’ worldwide, incurring costs of $7.3 Billion or more. Current investigations focus on various top executives responsible for letting the fraud happen, including research and development (R&D) managers Ulrich Hackenberg and Wolfgang Hatz. But is the scandal just the result of the ‘criminal energy’ of individuals, or is it a more systemic problem? Do rising pressures in a competitive global economy – meeting customer needs and shareholder expectations, driving down costs, adhering to norms and standards – perhaps promote individual cheating and corporate misconduct? Many would agree that corporate sustainability has become a buzzword, without actually changing corporate practices all that much. Recent news supports that: BP was found grossly negligent in the Deepwater Horizon disaster; the U.S. tobacco industry continues to rely on pre-teens working in the fields; and Pacific Gas & Electric is under legal scrutiny for allegedly causing a gas explosion due to suspected safety violations. So why aren’t all those sustainability strategies and programs, including new ‘sustainable’ products, the appointment of Chief Sustainability Officers, and the submission of regular sustainability reports, enabling corporations to become more sustainable? And what does it take to change that? This week, we would like to recommend a series of related debates on climate change, melting ice, opportunistic responses by oil companies, and Greenpeace activism. By Elke Schüßler, Freie Universität Berlin. David Levy’s bleak analysis of the carbon market is complemented by recent research by Charles-Clemens Rüling, Bettina Wittneben and myself regarding climate conferences as the sites of transnational climate policy making. While climate skepticism has long accompanied climate science and the debate about anthropogenic climate change, fresh skepticism about the structure and outcomes of climate policy processes is growing among those serious about saving our climate. The Kyoto Protocol, the much quoted “only game in town” in transnational climate policy, has failed to commit large industrialized countries and major carbon emitters such as the U.S. (in its first commitment period) and Canada (in its second) to binding targets for emissions reduction; the EU Emissions Trading Scheme, a cornerstone of supposedly ambitious European climate policy, has been written off by many civil society groups as well as by the European Parliament, voting against its reform in April; controversial energy production practices such as large-scale hydro-fracking are slowly but surely becoming more accepted even in countries such as Germany, a stronghold of the green movement. Meanwhile, the detrimental effects of climate change are being felt in both developed and developing countries, exemplified by the recent flood catastrophes in Europe and India. As climate policy is crumbling away, evidence grows to show that global warming and its threat to life on our planet is fact not fiction. Why have the decades of transnational policy efforts not produced better results?